Designed for all uses, it this the ultimate speaker cable? Looking pretty much like any other spaced-figure-8 cable, the description of this one on vdH's website proclaims so many technological features that one can only be impressed. Chief among these would seem to be the "dense silver coated high purity matched crystal oxygen-free copper". We couldn't find explanations for all of this, but we did note with interest vdH's analysis of different methods of silver-plating copper for audio cables - the company's chosen method apparently involves less mechanical stressing of the copper and leaves fewer damaging residues behind. 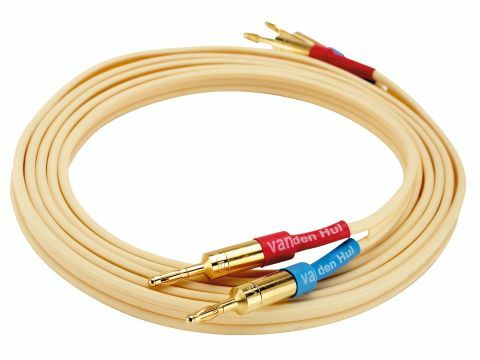 After all the words, does the cable actually sound any good? Bearing in mind its friendly price and good compatibility, we think it sounds good in context, but we weren't completely blown away. We really liked its bass, which was tight, rhythmic and extended - although perhaps not always quite as tuneful as some. Midrange is good with clear and stable imaging and no obvious tonal issues. But the treble struck us as a touch dry, lacking 'air' and subtle ambience cues.